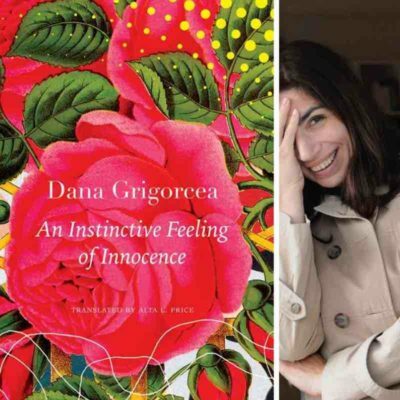 On translating Dana Grigorcea’s An Instinctive Feeling of Innocence. Bringing Romanian-born Swiss writer Dana Grigorcea’s second novel—published in German and shortlisted for the Swiss Book Prize in 2015, and already out in Bulgarian, Dutch, Italian, and Romanian—into English has been an adventure. At one point I sent her the excerpt a literary magazine wanted to publish. Her gracious reply pointed out a misinterpretation, “It’s funny: it is the same mistake the Romanian translators also made. It’s when the dog . . .” I didn’t need to read her clarification—I knew the exact sentence, because I’d considered querying her about it but decided not to. My thinking—given the way the book’s broader story flashes back and forth between Socialist Republic–era and present-day Romania—was that surely this dog stood for the average citizens of Bucharest, who’ve faced a lot of challenges but still manage to pick themselves back up again. And whether or not the analogy I saw was the same as the Romanian translators’, we’d all made the same decision, so in some way I must’ve been on the right track, right? Well, all three of us slipped up: the poor stray survived, only to get screwed by another dog. One of Dana’s go-to sections for European readings was the Michael Jackson passage. With good reason—it’s dramatic and wry, understated and also crushing. Having just landed in Bucharest, he opens his concert: “Hello, Budapest! I love you!” We both grew up with the King of Pop everywhere, but part of me suspected this section’s impact would be stronger outside the United States. I don’t know the right word for what Bucharesters felt when Jackson addressed them as Budapesters—disappointment, betrayal, disrespect?—but do know this particular minor character in the novel has once again come back from the dead with frightful relevance. One of the conversations I most enjoy with fellow translators is how they treat titles. Much like with cover design we often aren’t given any say, or working titles have a way of sticking, or other parties opt for the “more literal” rendering, which can be “less faithful.” This book’s title is drawn from a sentence in chapter two. We toyed around with the right adjective: instinctive, primary, primal. But these didn’t address my main concern about the feeling itself: the fact that Schuldlosigkeit is, yes, “innocence,” but that word has completely different baggage in English; it’s also “blamelessness,” “guiltlessness,” “sinlessness.” All very different. And none of them captured the conceptual overlap, in the root word Schuld, between having blame and being in debt. These connections are a key part of the book, especially chapter nine. Could you imagine how the United States would be different if the words for debt, guilt, and blame were etymologically related? In the end, we had no choice but to let that detail go. I might’ve even dreamed of using “An Otherwise Blameless Life” at one point—maybe working on this book was compromising my grasp on reality, much as the walls of Victoria’s reality are crumbling throughout the story. Thanks to the current situation in US politics making this final option such a sad, hilarious phrase, I’m thinking we could’ve benefitted from blamelessness’s SEO value. Luckily, if I learned anything from this book’s protagonist, it’s that everything changes—especially corrupt regimes. Join us in conversation with Dana Grigorcea, Alta L. Price, and Sarah Rose Etter at San Francisco’s Green Apple Books on the Park on March 21!